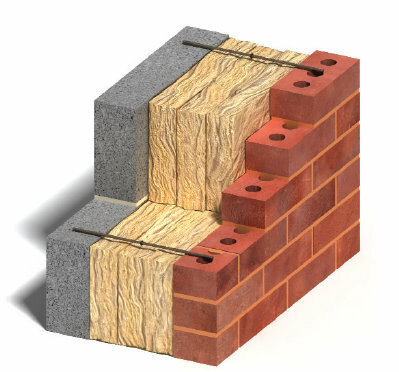 The most thermally efficient cavity wall tie system in the world is now available from Twistfix. Teplo wall ties have a thermal conductivity of just 0.7W/mK and are valued 0 in U-value calculations to EN ISO 6946. The low conductivity ties are manufactured from pultruded basalt fibres set in a matrix of epoxy resin. Twistfix will be holding stock of these basalt wall ties in lengths to suit cavity widths ranging from 55mm to 200mm. The TeploTie improves the thermal insulation of cavity walls by eliminating the thermal bridges that are present when using stainless steel wall ties. CO2 emissions are reduced through significant improvement in the U Value of masonry walls. U value reductions of up to 10% have been calculated for traditional cavity sizes (50mm – 100mm). More significant reductions apply in wide cavities (150-200mm). Twistfix have a wide range of cavity wall ties to suit new construction and retrofit applications.